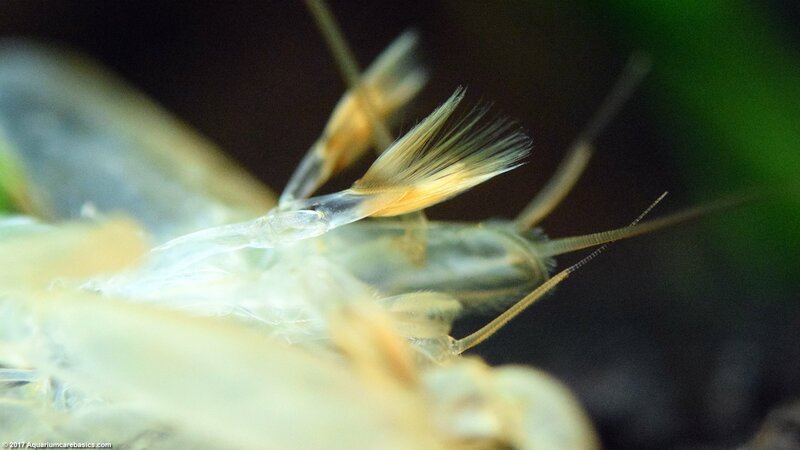 A very common freshwater aquarium shrimp is the Bamboo Shrimp, also known as Wood Shrimp, Asian Filter Feeding Shrimp, Singapore Shrimp, Singapore Wood Shrimp, Singapore Flower Shrimp, Fan Shrimp, Flower Shrimp and Atyopsis moluccensis. Bamboo Shrimp are native to Southeast Asia and can be a very interesting aquarium shrimp in a tank. Bamboo Shrimp are readily available for sale at both local fish stores as well as chain stores They are available in small, medium and large sizes. 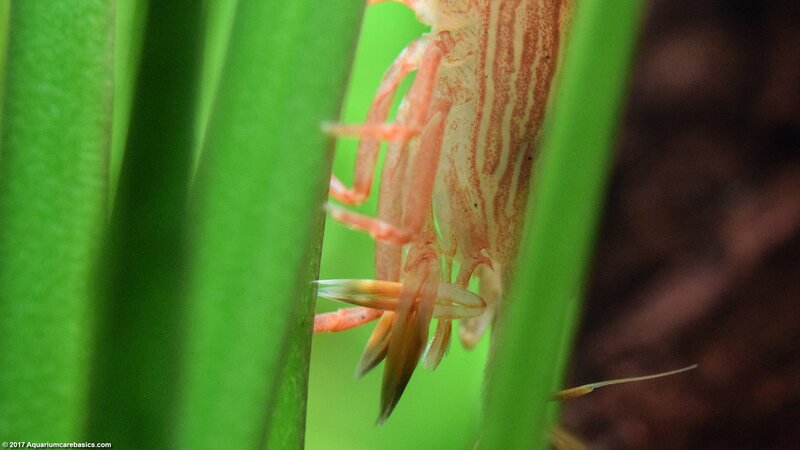 Before you buy, make sure your Bamboo Shrimp has all of his legs, antennae and eyes. Also look to see if the shrimp has good color, and is otherwise active and healthy. 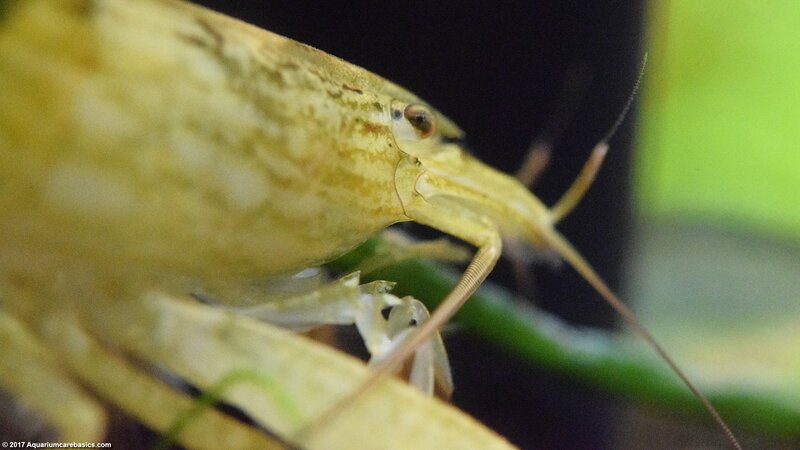 Bamboo Shrimp are very peaceful in disposition. They are non-aggressive and are really fun to watch. Aquarium pH: 7.0 – 7.5, with some suggesting range could be a bit wider. Hard-Soft: Aquarium Water on the hard side. Lighting: Normal tropical community tank lighting. 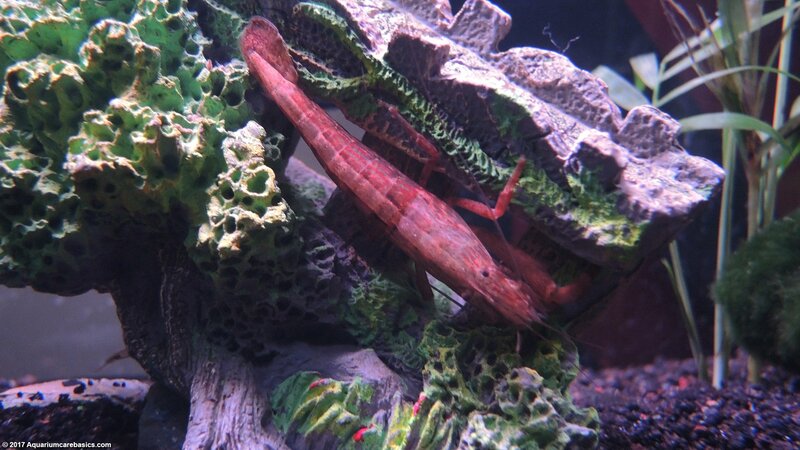 Note Regarding Copper & Plant Fertilizer: A big Bamboo Shrimp care issue involves copper. As with all freshwater aquarium shrimp, its important to avoid copper, as it’s fatal to them. Also be careful with plant fertilizer pellets. Once placed in the substrate, plant fertilizer pellets remain there and dissolve slowly. But if the substrate gets moved around and the dissolved pellets get stirred up, it releases whatever is in them into the water column. 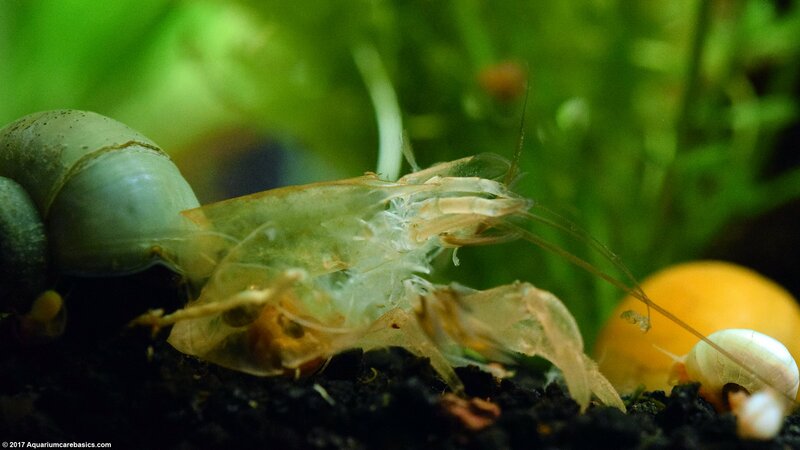 This sudden burst of plant fertilizer in the water column can be consumed in large concentrations by filter feeding shrimp, and it may be harmful or fatal to them. So check to see if the plant fertilizer of choice is “shrimp safe”. And even if it is, take care not to accidentally release bursts of the fertilizer into the water column. 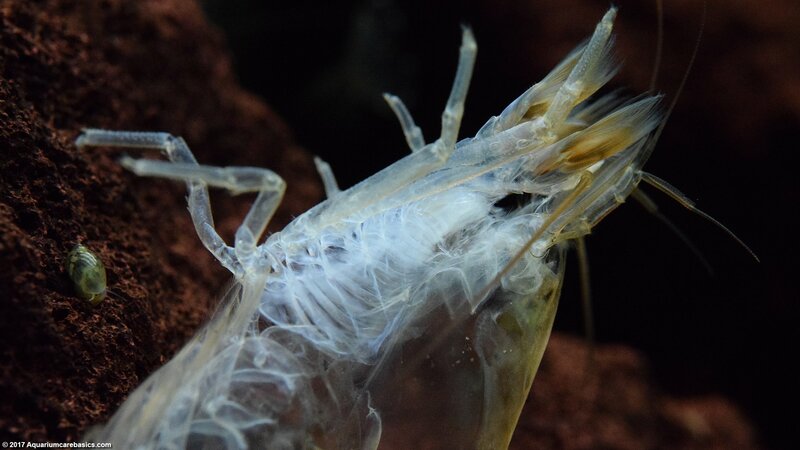 Another issue to look out for is when a shrimp hides motionless for long periods of time without feeding. 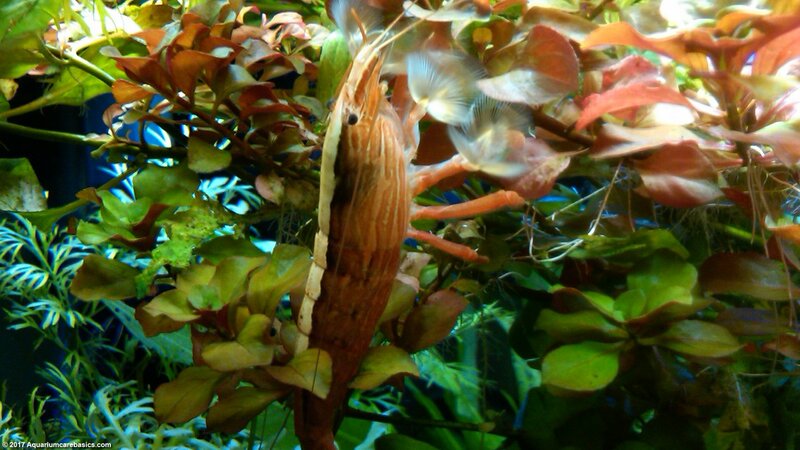 The shrimp may be under a plant leaf, under a rock, behind a decoration or behind a power filter intake, for example. While this may be normal behavior consistent with preparing to molt (as explained below), it may also be an indication that something is wrong. This is especially true if the shrimp does not molt and feed after a couple of days. If the shrimp remains listless, be sure to check the water parameters to make sure the everything is within the proper range. Bamboo Shrimp like tanks with lots of live aquarium plants. The aquarium plants provide many places to climb on, hide under and explore. Aquariums with live plants are never “too clean”, meaning that there are many little bits of edible matter floating in the water column. Bamboo Shrimp also like their habitat to include lots of rocks, like lava rocks for example. They really like to climb on, in, around or under them as they position themselves facing the water movement. 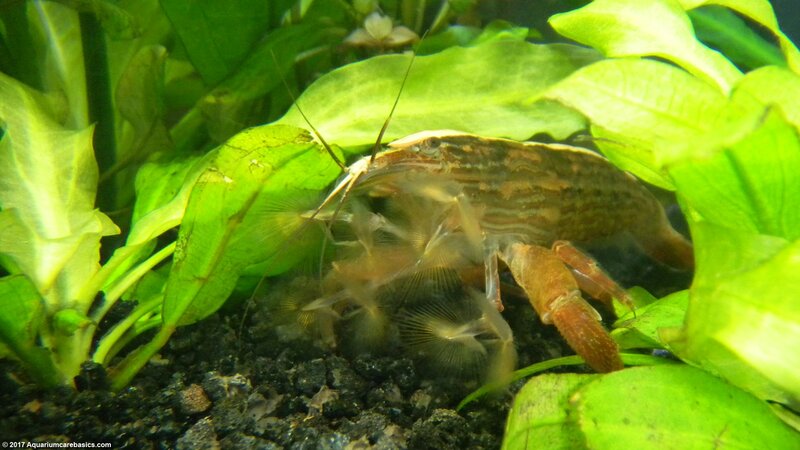 Finally, Bamboo Shrimp seem to like tanks with sponge filters on powerful HOB power filter intakes. The shrimp often position themselves on the sponge filter to intercept the edible matter that would otherwise get sucked up into the filter. As for tank size, remember that filter feeding shrimp pull food from the water column. This means that there has to be enough water volume in the tank to support their food needs. So the bigger the tank, the better. 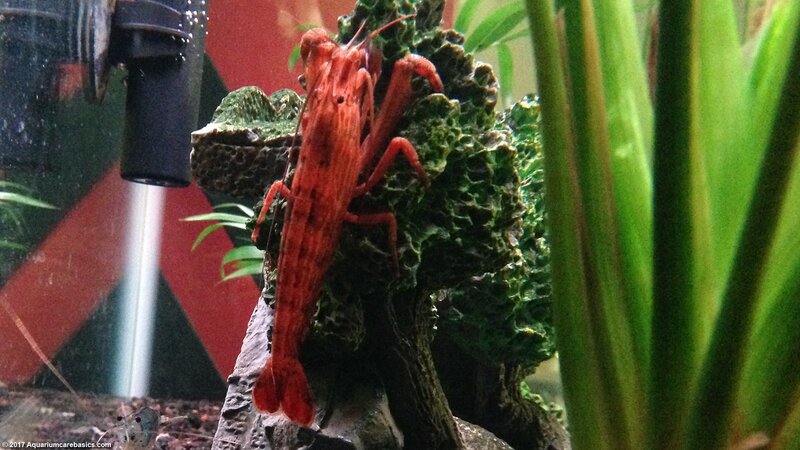 That said, its probably a good idea to keep one Bamboo Shrimp for each 20 gallons of water. Keep in mind that filter feeding shrimp feed best from water moving constantly and quickly, so a 20 gallon long tank may be a better choice than a 20 gallon high tank. The deeper water in the 20 gallon high tank may move too slowly for the shrimp to feed adequately. A healthy Bamboo Shrimp will grow to be about 2 – 3 inches in size when fully mature. Their lifespan can be a 1 – 2 years, or a bit more with proper conditions and a bit of good fortune. 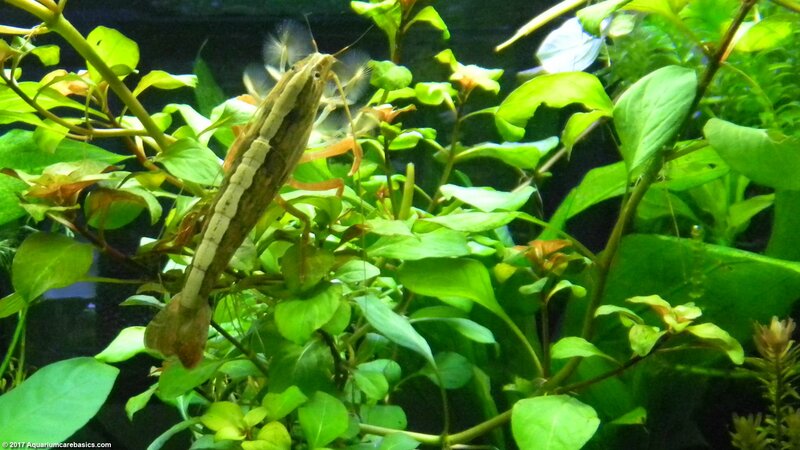 That said, its not uncommon for Bamboo Shrimp to die soon after being added to a tank. Maybe its the shift in water parameters or the stress of being transported from the store, but either way they are at risk after being added to the tank. 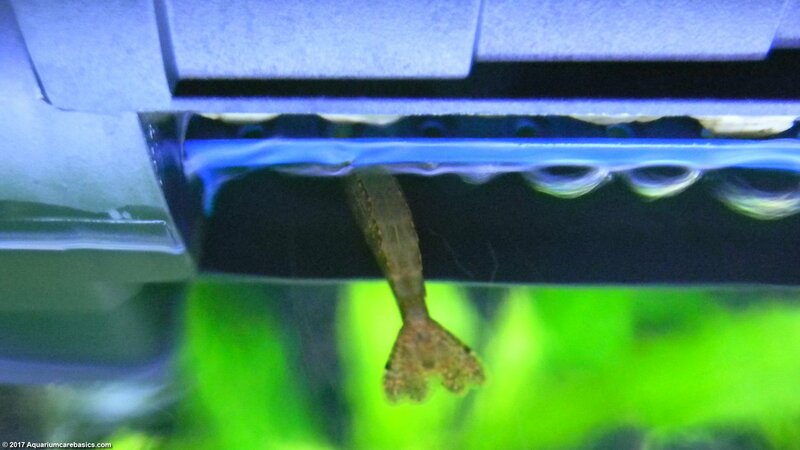 Normally, filter feeder food consists of very fine particles of fish food, plant debris, micro-algae, micro-organisms and other matter floating in the water of an established aquarium. 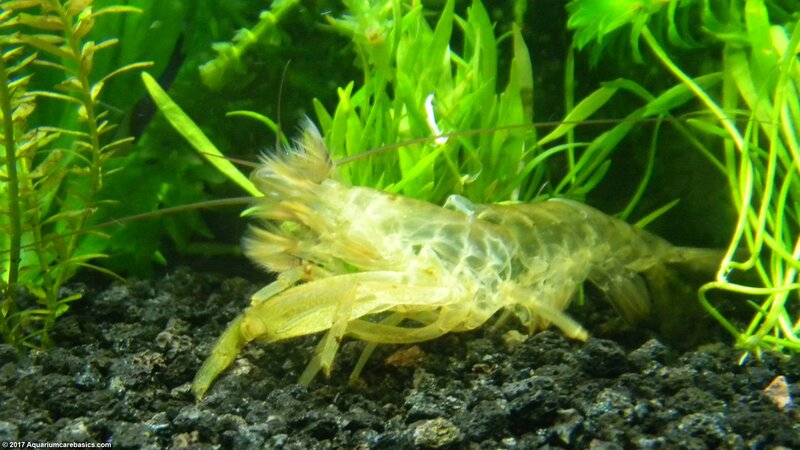 I’ve been successful with one Bamboo Shrimp being able to find adequate levels of food in the current of a well planted 20 gallon long aquarium, and it has grown quite large. 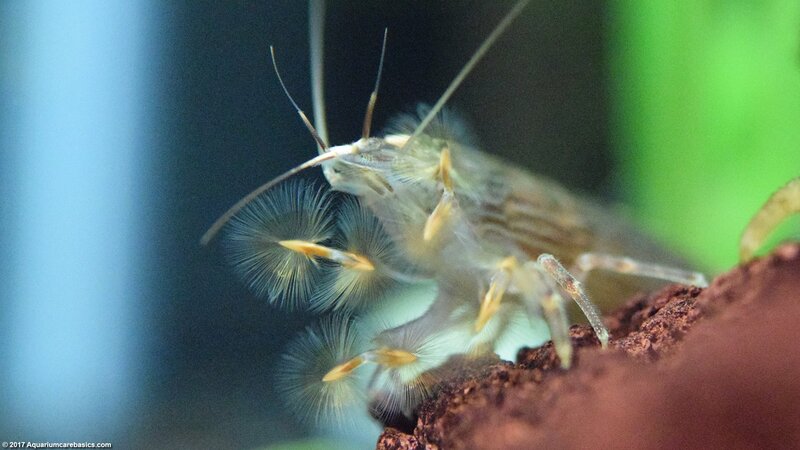 Bamboo Shrimp seem to enjoy when the aquarium gravel or aquarium substrate gets stirred up when re-positioning a rooted plant, and small concentrated bursts of fine food particles get released into the water (but see note about plant fertilizers above). 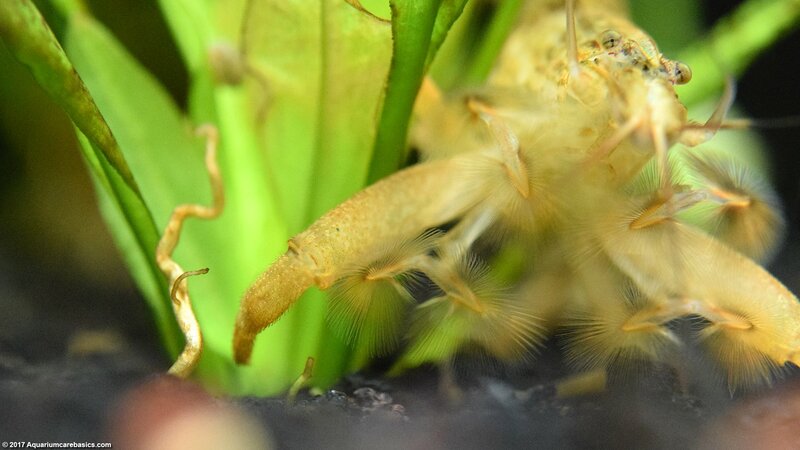 The Bamboo Shrimp actually get really close to the action for what appears to be a feast. 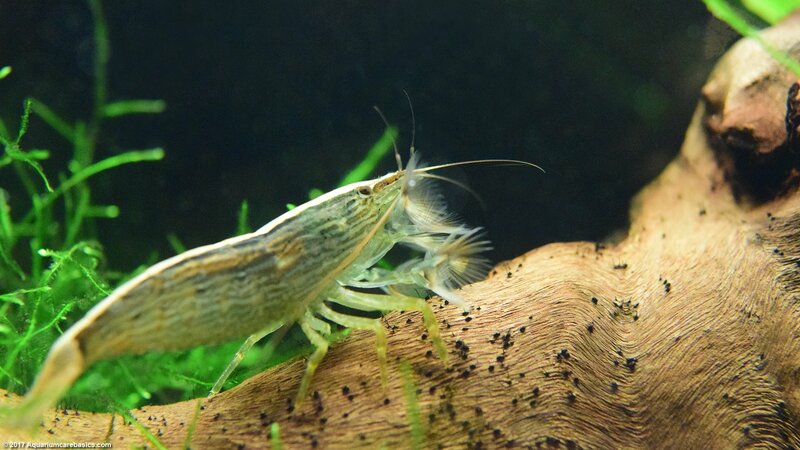 Another thing that I’ve noticed is that Bamboo Shrimp seem very active after water changes or a filter media cleaning. 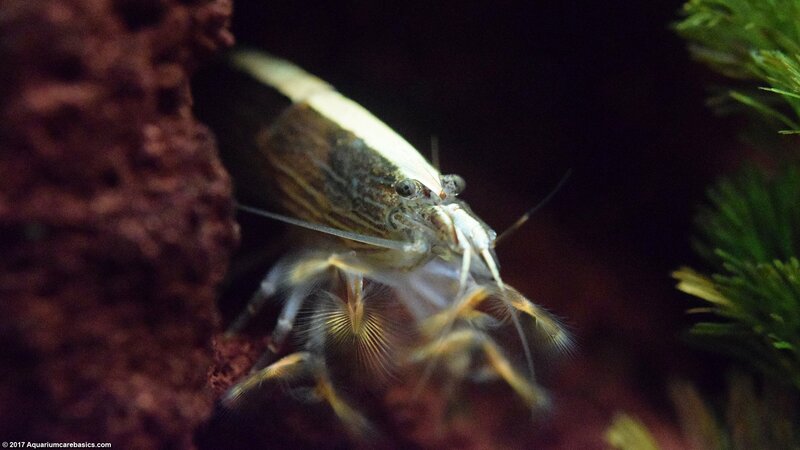 When I change or adjust a filter cartridge, small food particles get released back into the aquarium and bamboo shrimp really go to town on it. 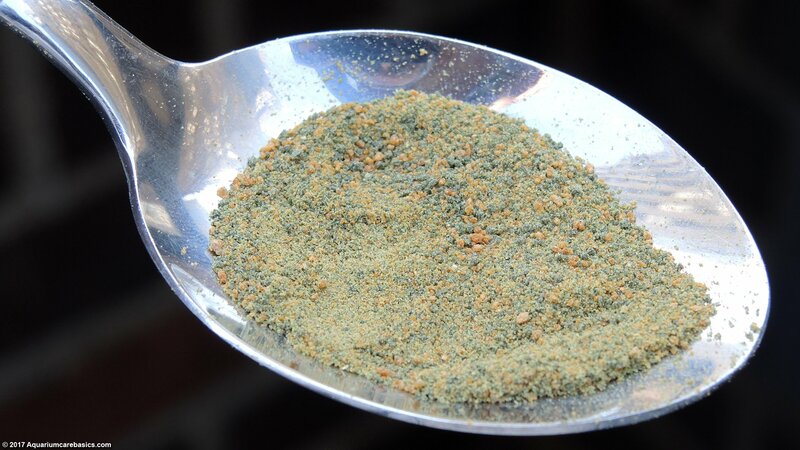 A supplemental source of Bamboo Shrimp food that I use is an algae wafer very finely pulverized and then softened into a light paste with a few drops of aquarium water…with the concoction then being dropped into the upstream current. 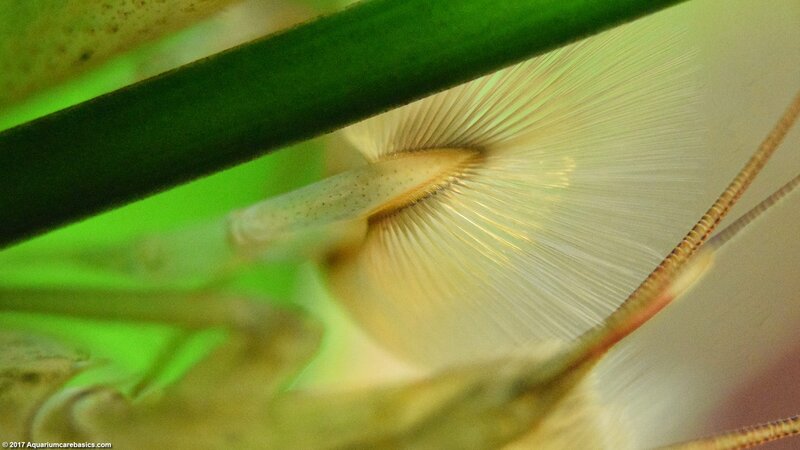 The little particles of algae wafers fill the current and land right into the Bamboo Shrimp’s feeders. It seems to work out well. Just be sure not to over feed, as all the extra food can add too much organic material to the tank and cause a bacterial bloom. 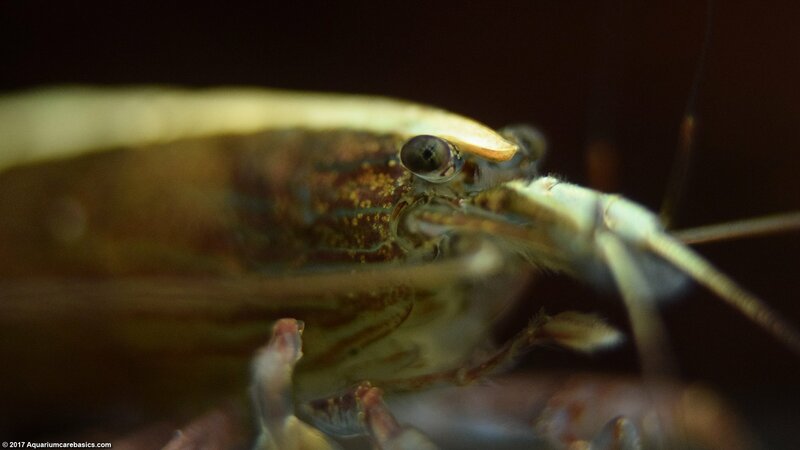 An interesting thing to watch is a Bamboo Shrimp feeding continuously throughout the day. 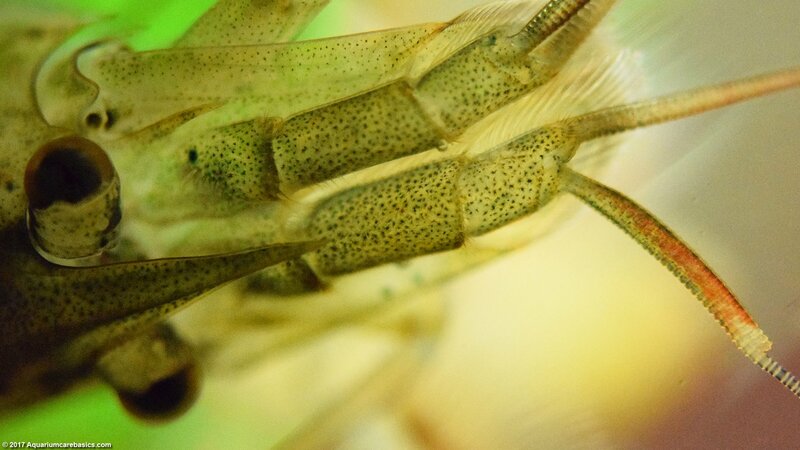 Bamboo shrimp feeding occurs as food is filtered from the water current by what appear to be four fine “baseball mitts” that they hold up in front of their faces. 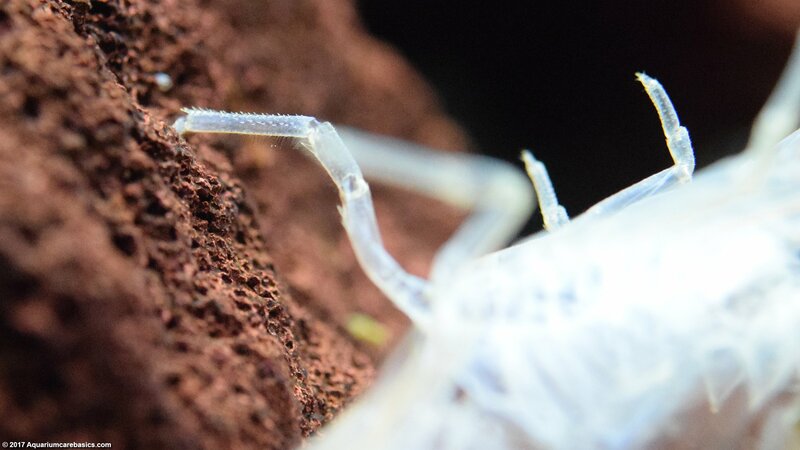 Bamboo shrimp often position themselves facing the current and hold up their little mitts. 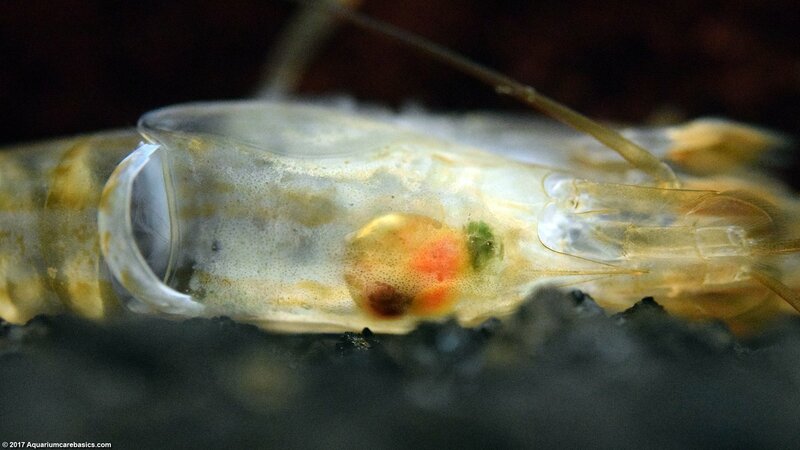 Every couple of seconds the shrimp moves one of its mitts into its mouth and takes the off the bits of food. We have watched our shrimp for hours and it seems like there is a pattern by which they clean off their mitts. It’s interesting to see all of the different places our shrimp stands, changing positions throughout the day and night. Our Bamboo Shrimp is sometimes very active at night. It’s very important to keep the tank covered properly because they tend to climb at night to get a real good angle near the power filter and they can fall out of the tank. If they fall out of the tank, they don’t last long, so be sure to check periodically to ensure that all the shrimp are accounted for. 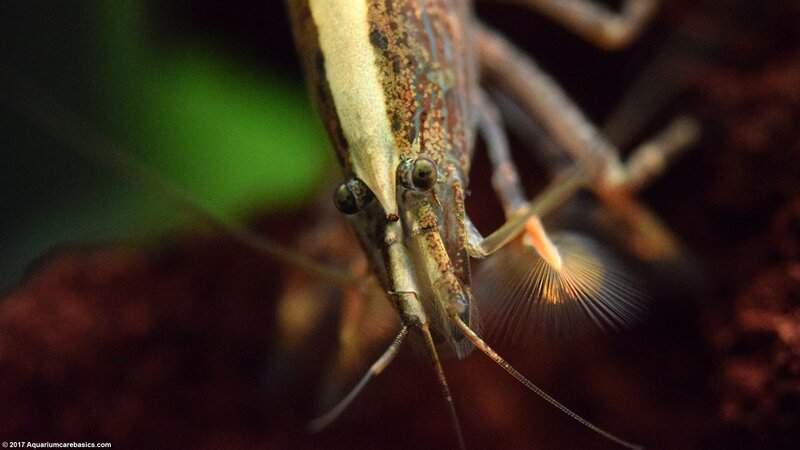 Bamboo Shrimp are often not fed well in stores, so when they first get into their new tank they can be very hungry or even starved. 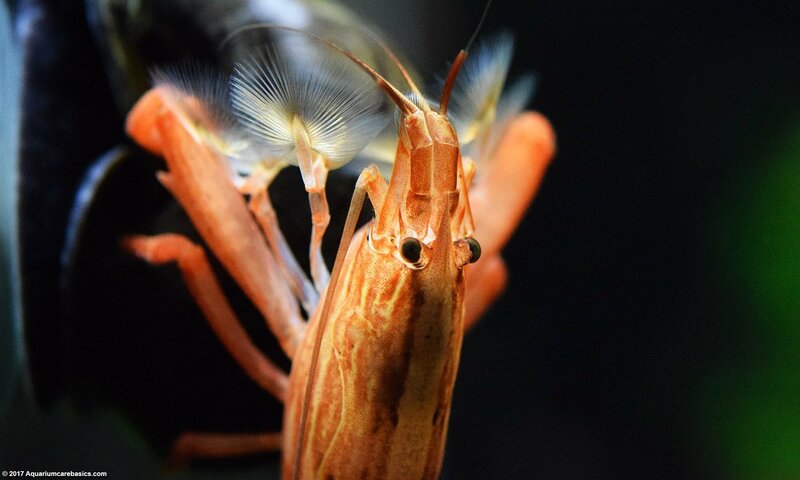 Bamboo Shrimp are often seen walking on on the bottom of the tank picking at substrate searching for edible matter in their new home. This is not uncommon behavior when they are very hungry, so be ready to offer them a food supplement to help them fill up. 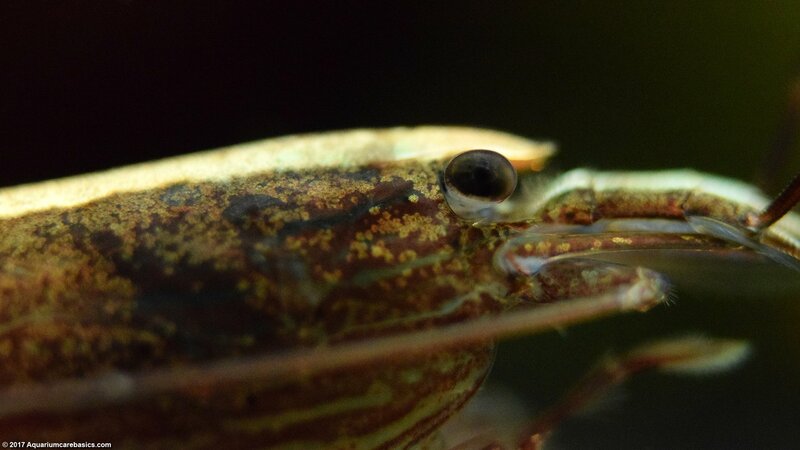 I once had a new Bamboo Shrimp stand on a sponge filter and nearly eat it clean of debris. But thankfully after a few days, he was back on the right track, positioned in the water eating normally. 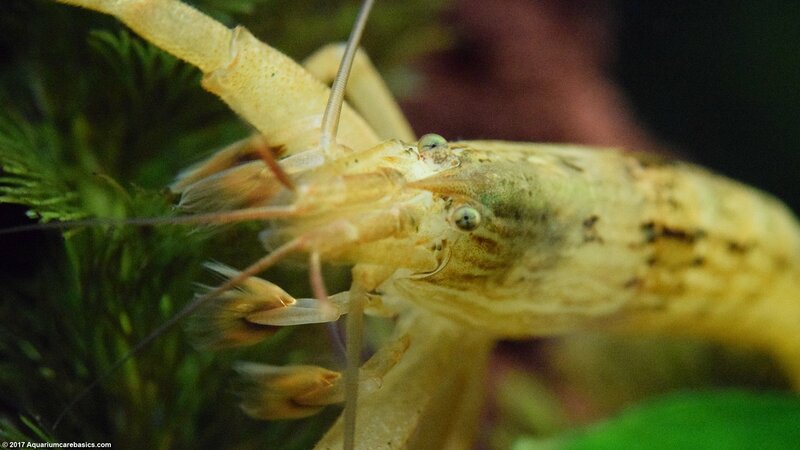 Bamboo Shrimp have a non-aggressive disposition and have no claws or pincers to either attack or defend themselves. Bamboo Shrimp tank mates are generally any community tank inhabitants including medium size tropical fish. Don’t mix Bamboo Shrimp with Goldfish, Oscars, Jack Dempseys or other cichlids because the Bamboo Shrimp will be eaten. 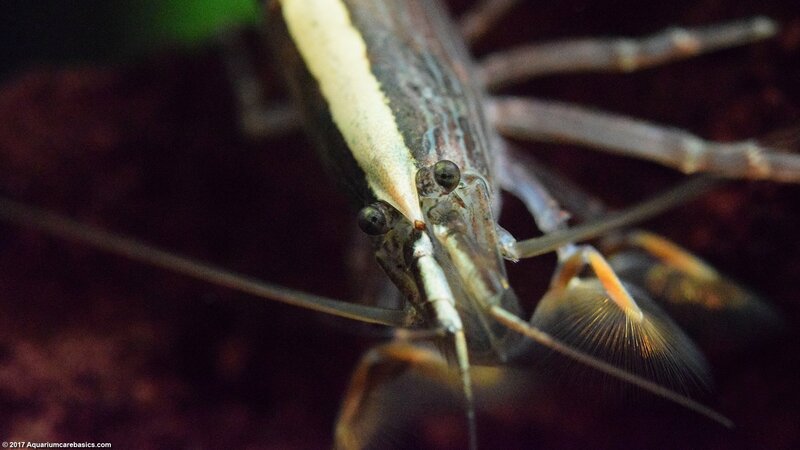 Aquarium crayfish can also attack and eat Bamboo Shrimp as well. 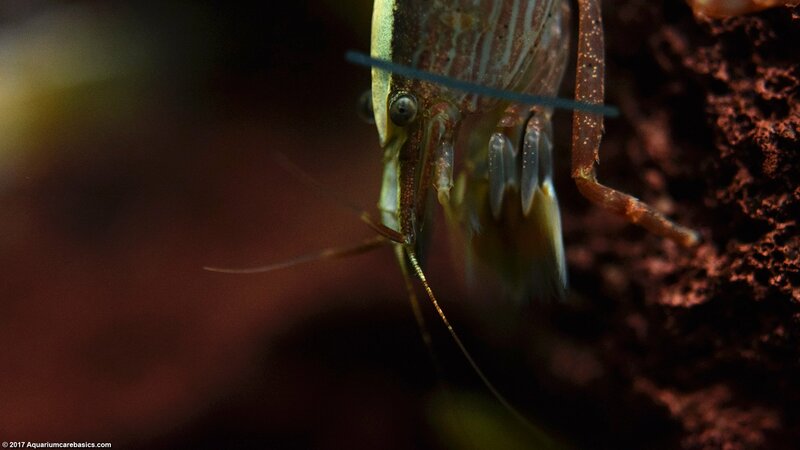 Bamboo Shrimp can live well with others of their kind, as well as most community tank inhabitants. 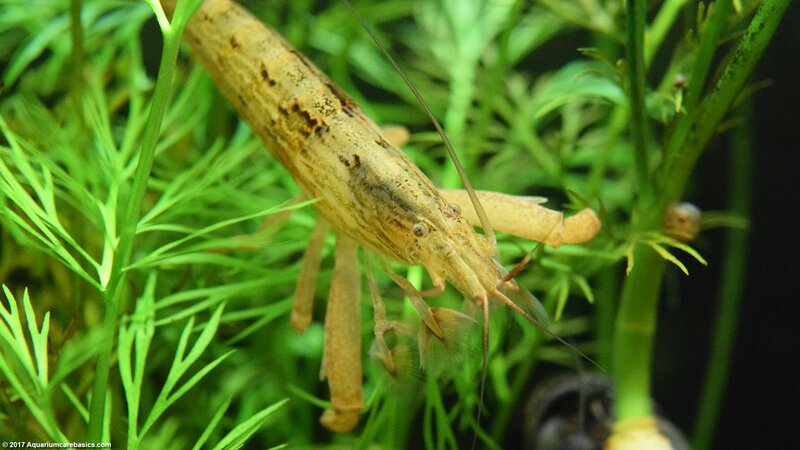 Bamboo Shrimp can also do well with Vampire Shrimp, Amano Shrimp, Red Cherry Shrimp, Ghost Shrimp, Nerite Snails, Mystery Snails, Gold Inca Snails, Ivory Snails, Ramshorn Snails, Malaysian Trumpet Snails, Rabbit Snails, Japanese Trapdoor Snails, Assassin Snails, Cory Catfish and Otocinclus Catfish. If there are any questions regarding species compatibility, it always a good idea to ask the store clerk before buying. An interesting thing about these shrimp is how well they get along with others of their kind. If tank size permits, its really fun to see groups of Wood Shrimp hanging out together in the water. They usually all bunch up together in very close quarters as they face the intense current. Of one gets too close to the other, they simply move around a bit to sort the issue out. They never show any outward signs of aggression for territory, and they just seem happy to all feed together for hours on end. 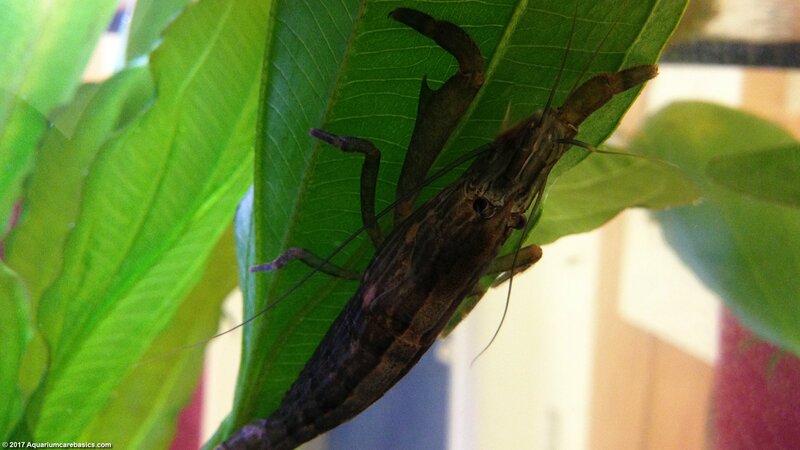 The Bamboo Shrimp molting process has occurred for our shrimp nearly once every two months or so. 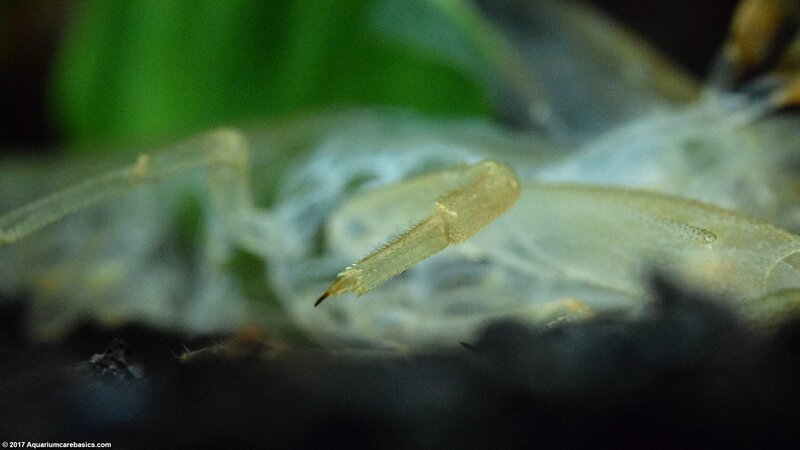 The signs of Bamboo Shrimp molting are the same. 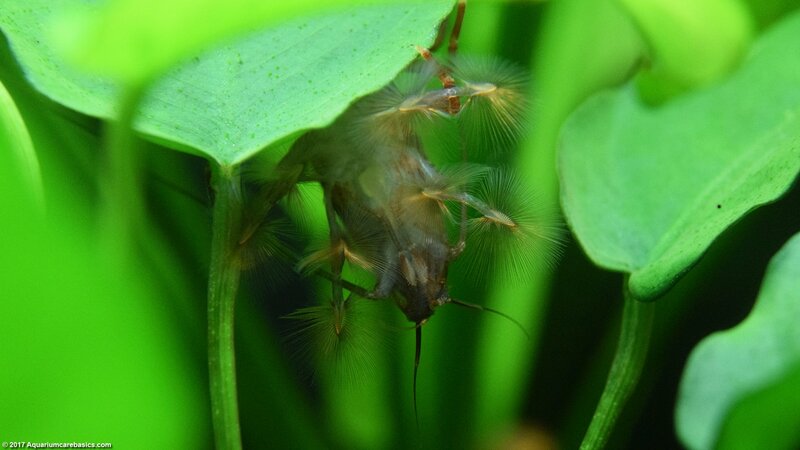 About a day or two before molting, the Bamboo Shrimp begins to hide behind things like rocks, plants, the heater, a power filter intake or a sponge filter. So it’s important that Bamboo Shrimp have plenty of places to hide. 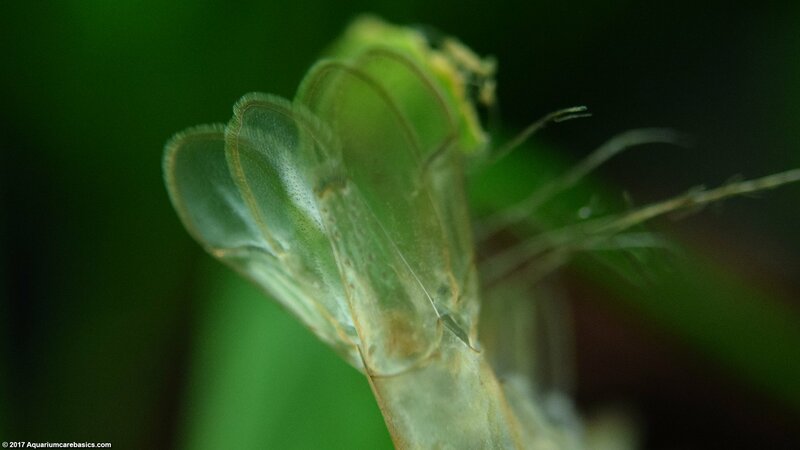 After the molting cycle is completed, the Bamboo Shrimp leaves its old empty shell in the water. 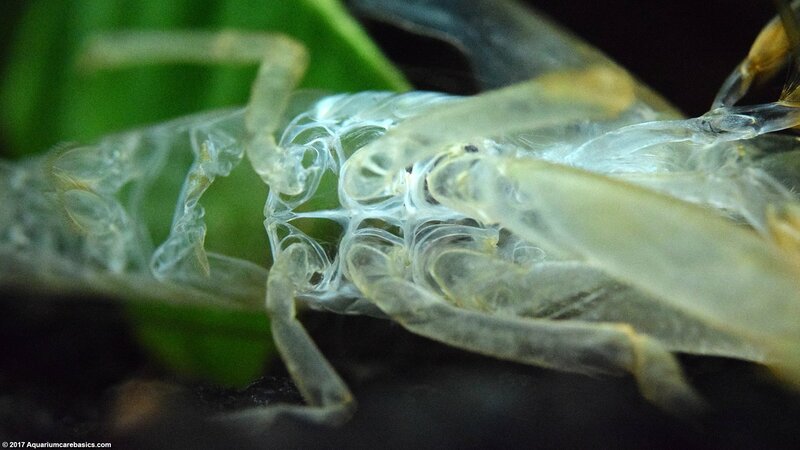 Some hobbyists leave the molted shell in the water for a couple of days just to see what happens. Bamboo Shrimp may eat it to re-ingest the nutrients but it wasn’t interested. 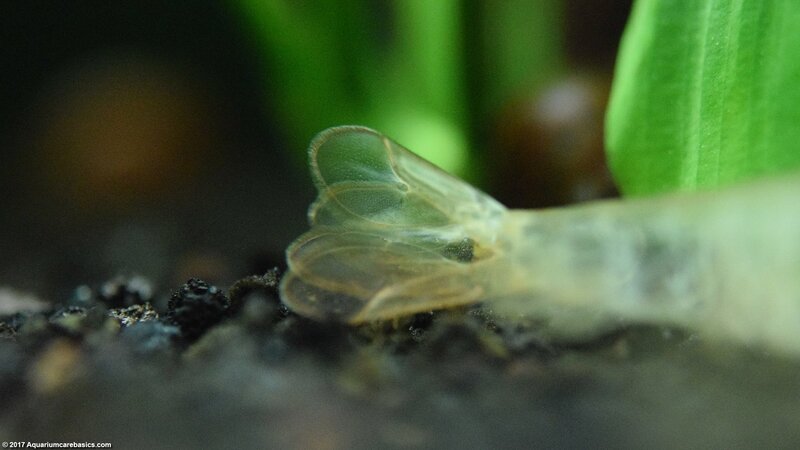 But the interesting thing was that the Amano Shrimp, Ghost Shrimp, Red Cherry Shrimp and Otocinclus Catfish were interested in picking at the molted shell. Then the snails started eating off it. In the end, the remaining uneaten shell just dissolved away. Hopefully this means that the shell minerals dissolved back into the water. As a rule, it’s good to remove dead fish, shrimp and snails from an aquarium as soon as possible. But there was a time when I missed a dead bamboo shrimp. What happened next was very interesting. 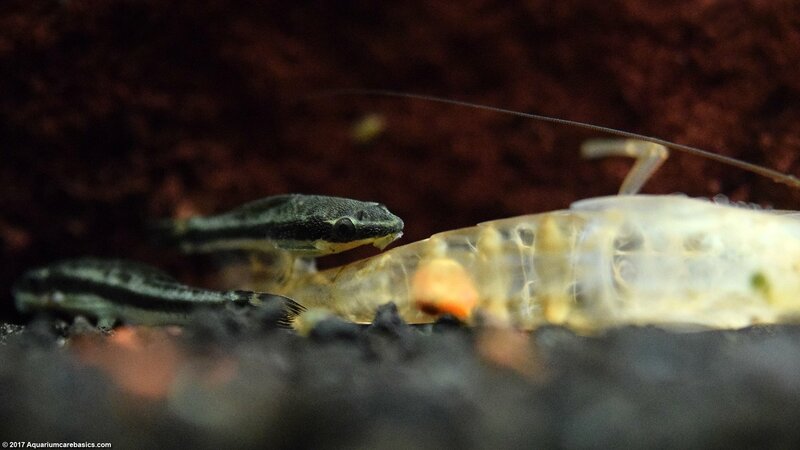 The dead bamboo shrimp was quickly surrounded by Amano Shrimp and snails that began eating it. 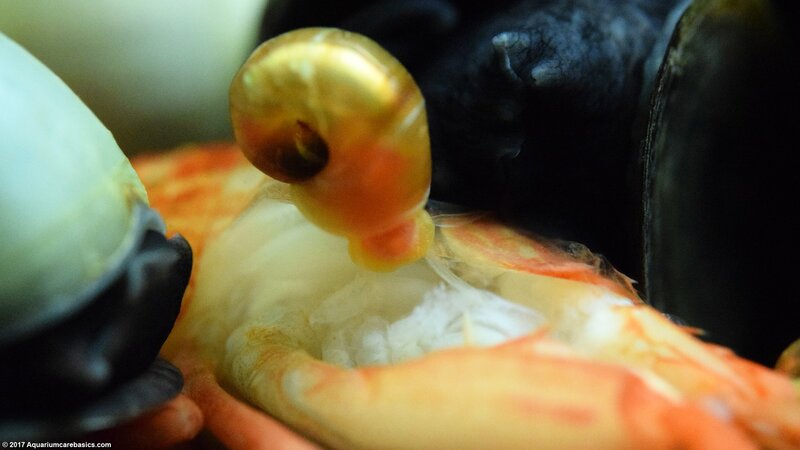 But they seemed more interested in ingesting the shell as apposed to the shrimp body itself. 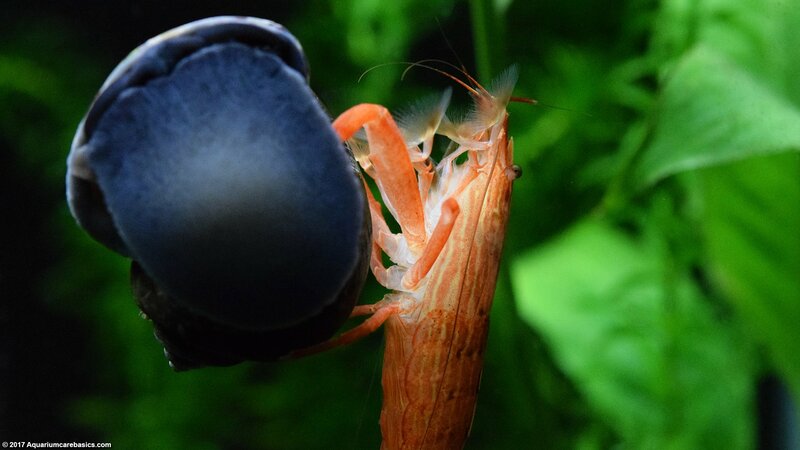 As soon as the shell was eaten, the Amano Shrimp and snails moved on leaving most of the body behind. 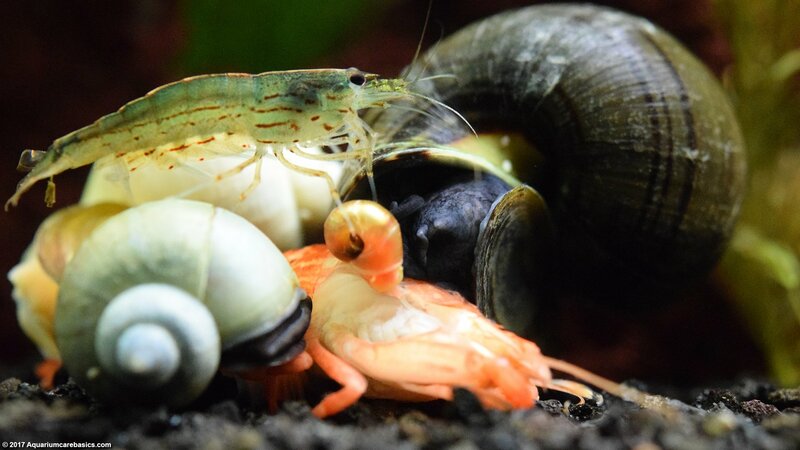 I figured that some tank mates would be interested in eating the shell, but what seemed different this time was the speed in which they all converged on the dead shrimp and the intensity in which the shell was eaten. With the dead shrimp, it was much more intense compared to how they ingest a regularly molted shell. The shell on the dead shrimp seemed much more appealing to them. 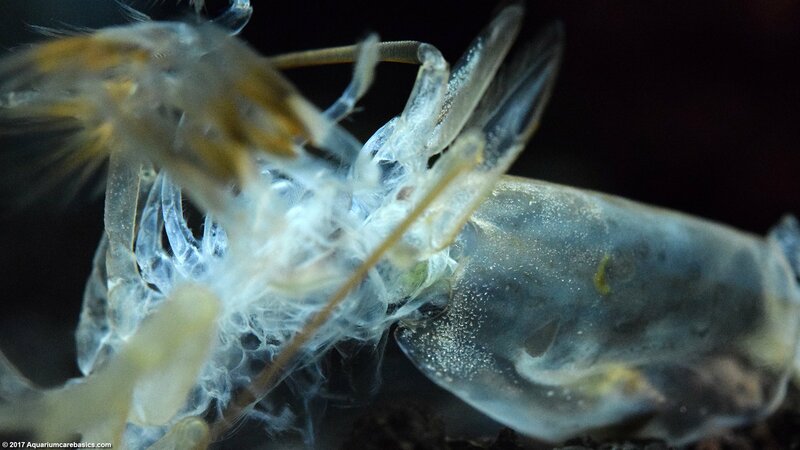 As noted above, a Wood Shrimp uses a set of web-like fans to filter food from the water. The fans are one of the most interesting aspects of this shrimp. But the shrimp has other intricate details that are interesting to see as well. One of these intricacies are its sets of antennae. The outermost pair start at bases located on each side of the shrimp’s head, right next to its eye stalks. The bases are thick and seem to have a “joint mechanism” allowing them to bend, rotate and move easily. 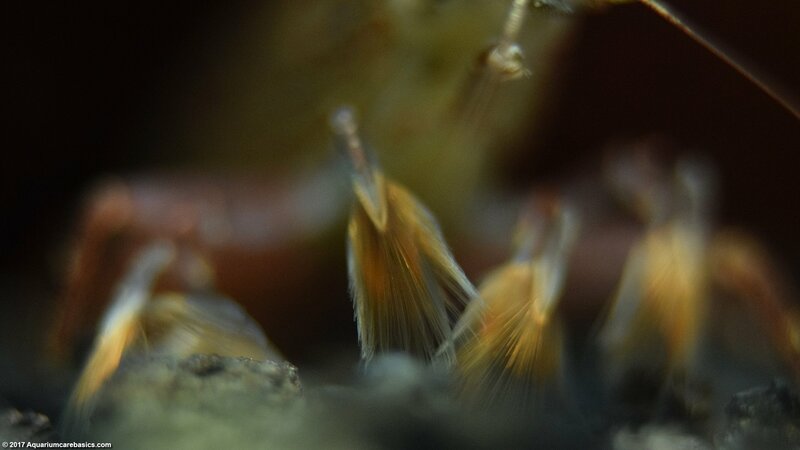 These outermost antennae can grow to be very long, thin and flexible. And they can often be seen sticking high up above the shrimp’s head. 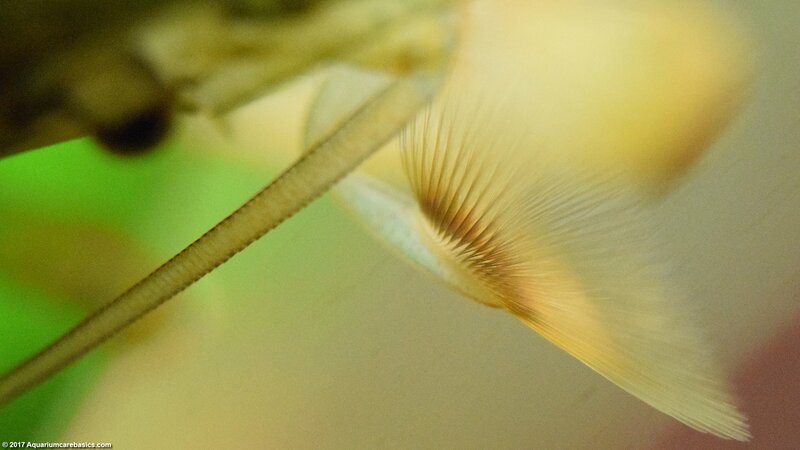 In addition, inner antennae protrude forward from the front of the shrimp’s head. There are two short, thick base sections from which two pairs of inner antennae emerge. These shorter inner pairs move back and forth as well. 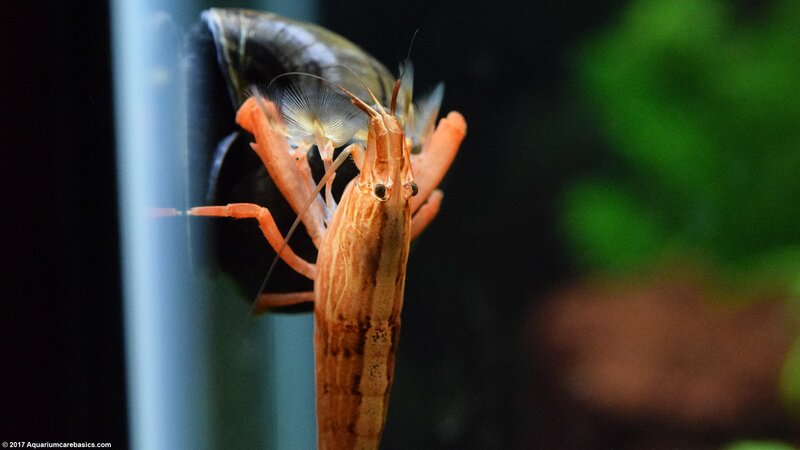 Not sure what the antennae to scientifically, but if a tank mate accidentally brushes the antenna while the shrimp is feeding, it triggers a quick reflex reaction, and the shrimp pulls its feeding fans in for protection. The shrimp also has two short eye stalks on the top of its head. The eye stalks are on either side of its rostrum. The eye stalks appear to be thick at the base and can be pulled down quickly should trouble arise. The shrimp’s carapace section is long and thick in diameter. The carapace shell has a “wood-grain” look to it, with line patterns running the length of its body. The shrimp’s legs are attached under the carapace, with the front legs being the longest and strongest looking. Moving back, the legs get shorter and thinner. And the under area where the legs are attached looks like quite a system of joints allowing for great flexibility and independent movement. Behind the carapace are six abdominal segments. These segments are connected in a way that allows the abdomen to bend easily. The segment closest to the carapace appears to have the thickest diameter. The diameter of the subsequent segments tapers off moving toward the tail. 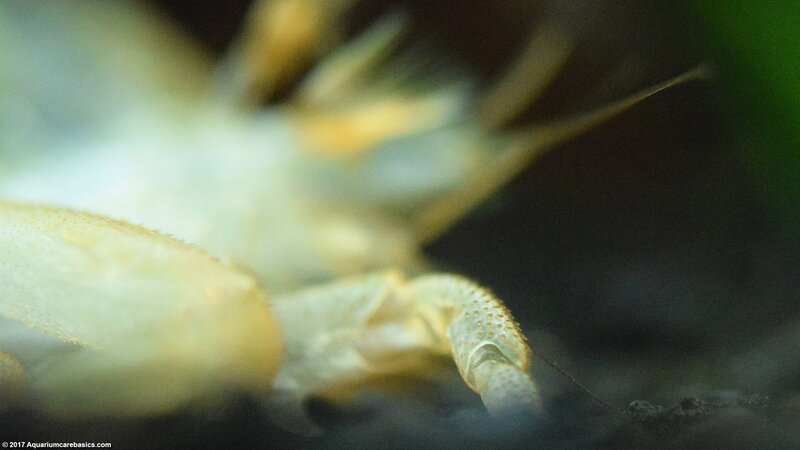 While the abdominal segments are flexible, a Wood Shrimp does not seem to arch their abdomens as much as Amano Shrimp do. 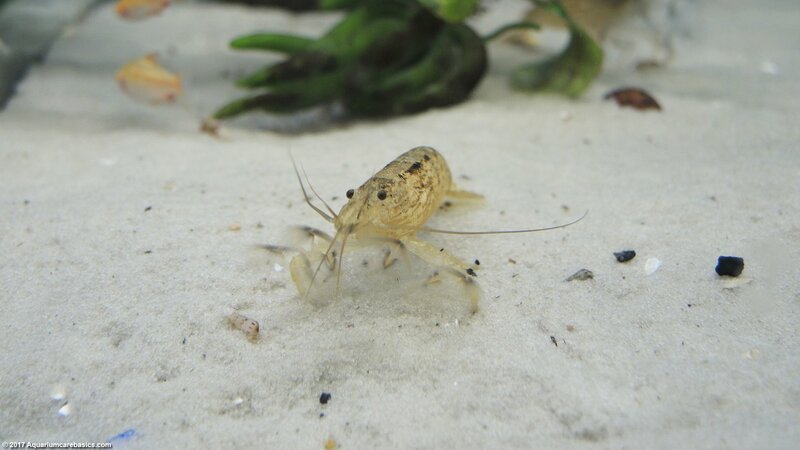 Wood Shrimp position themselves where they want to be, staying relatively streamline as they feed. The tail is connected to the sixth abdominal segment. The shrimp’s tail is made up of four thin flat shell segments and a telson. The segments can slide a bit to make the tail wider or more narrow. 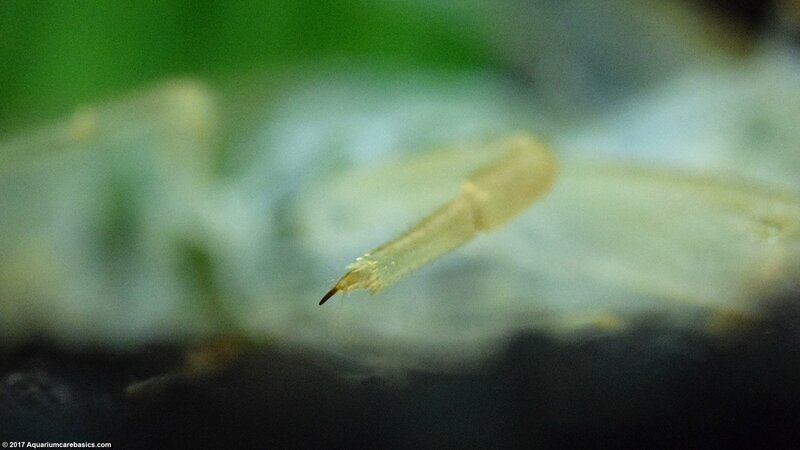 There is a set of very fine looking filaments that appear around the edge of the tail segments. The tail can be used to snap under the abdomen very quickly. This motion creates a backward thrust that propels the shrimp backwards as a defensive escape maneuver. A Bamboo Shrimp color range is generally a brown-reddish with a very pronounced and wide egg-shell colored stripe down the back. The Shrimp’s color also shifts ranging from more red than brown and then more brown than red. 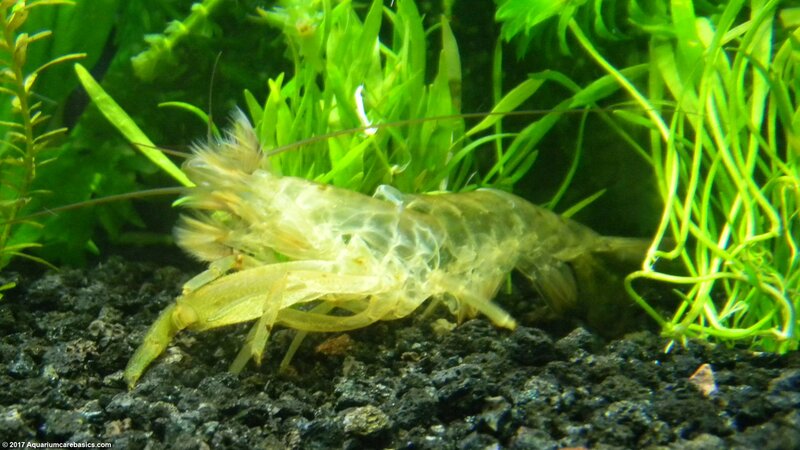 Occasionally, Bamboo Shrimp color turns greenish and sometimes it shifts to the orange-ish or yellow-brown side. 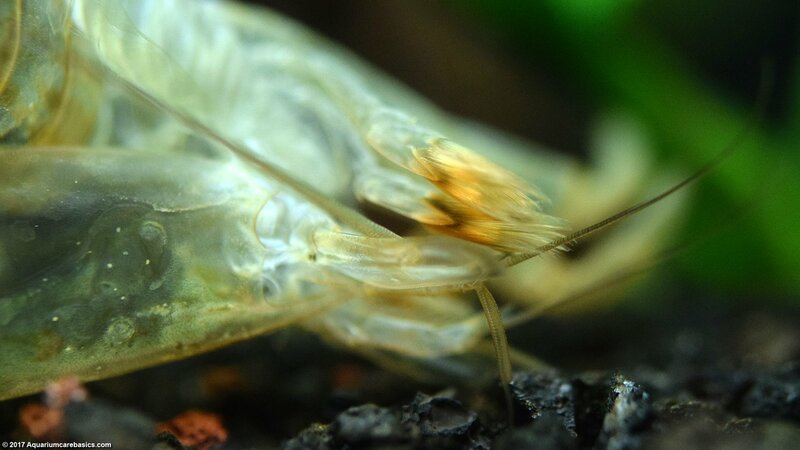 Bamboo Shrimp color is a pale brown-reddish immediately after molting. These color range changes appear to be normal, and it’s really quite amazing to see all of the interesting color changes that occur with this shrimp.